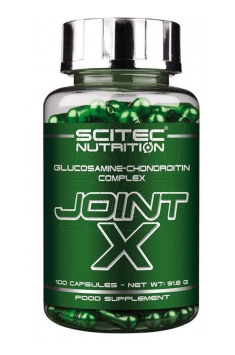 Scitec Joint-X is a unique formula designed to strengthen connective tissue. The preparation contains four compounds: gelatine, glucosamine and chondroitin sulphates, and MSM. Their beneficial effect on the health and condition of bones and joints has been confirmed by numerous scientific tests. Glucosamine is a natural chemical compound of the amino sugar group. It is formed in the process of endogenous synthesis with the use of glucose and glutamine. Glucosamine used in supplements is usually obtained from crustaceans and molluscs. This preparation contains glucosamine sulphate, which is considered to be the best-assimilable form of the compound and its efficacy has been confirmed by numerous clinical tests. The greatest amounts of glucosamine are deposited in cartilage tissue, where it performs above all the cushioning function. Additionally, it supports the production of the synovial fluid, which lubricates joints and prevents excessive friction. Initially, it was believed that glucosamine stimulates collagen production; however, recent research suggests a different mechanism of its activity. It turns out that it inhibits the activity of interleukin 1, that is the protein that regulates the inflammatory response and degrades collagen. Blocking the expression of IL-1 reduces the inflammation and slows down collagen breakdown. As a result, it gives better results than just collagen synthesis. Chondroitin is another chemical compound produced naturally in the human organism. It is the main component of joint cartilage and it promotes the production of proteoglycans (integral element of connective tissue). Chondroitin gives cartilage tissue the right endurance and helps to nourish it. Additionally, it reduces the loss of water from the jelly-like substance that is produced out of proteoglycans for protective and cushioning purposes. That way it protects joint cartilage from damage. In vitro tests have demonstrated that chondroitin along with glucosamine induces endogenous collagen synthesis. The combination of both components proves excellent in the therapy of joint space narrowing, which causes a great deal of pain and occurs as a result of joint cartilage wear. Methylsulfonylmethane (MSM) is an organic chemical compound whose profile is similar to that of water. Because of that it is believed to be one of the safest for the organism. MSM’s structure includes sulphur, and it is thanks to that element that the substance has so many health-promoting properties. Sulphur is used by the organism, for example, to synthesise collagen, or produce mucopolysaccharides (such as hyaluronic acid). Apart from strengthening the condition of the musculoskeletal system, MSM also exhibits anti-inflammatory and analgesic properties. It regulates the organism’s inflammatory response by inhibiting the release of pro-inflammatory cytokines, reducing nitric oxide levels, and decreasing the concentration of prostaglandins E2. It efficiently reduces pain, swelling, which can accompany an inflammation, and improves the mobility of joints affected by the disease. Gelatine is a type of protein obtained in the process of partial hydrolysis of collagen. It contains substances that are naturally present in human connective tissue, joint cartilages, tendons and ligaments. It is a rich source of collagen proteins and peptides. When it comes to joint regeneration, three amino acids are of the greatest importance, all of which are contained in gelatine in great amounts: glycine, proline, and hydroxyproline. They determine the right process of collagen production, have a beneficial effect on the endurance of the musculoskeletal system, and prevent osteoporosis. To sum up, Scitec Joint-X is an excellent way to improve the condition of bones and joints in the organism. The preparation was designed mainly for athletes but it can just as well be used by people whose age, job, or other factors expose them to musculoskeletal system overload. Take 1 capsule 4 times a day, preferably with a meal. People exposed to excessive strain on the musculoskeletal system should preventively take 4 capsules daily. It is good to divide the recommended dosage into two servings and take a few hours apart. If supplementation is introduced in order to accelerate convalescence after an injury or to reduce pain, supplementation should last at least 3 months. Components contained in the preparation work in synergy with vitamin C, so it is worth including in supplementation as well in order to reinforce the efficiency of therapy. Dextrose, bovine gelatin, Raising Agents (Magnesium Stearate, Tricalcium Phosphate) Colors (Titanium dioxide, Cooper Complex of Chlorophyllins). Universal dietary supplement with a broad pro-health action. 5-MTHF is up to seven times more bioavailable than ordinary folic acid. Pantothenic Acid is vital for countless cell functions as the maintenance of healthy cellular metabolism. A fat-soluble and stable form of vitamin C that is effective as an antioxidant. MSM (Methylsulfonylmethane) - dimethyl sulfoxide derivative, wherein the sulphur content is as by creating structural bonds sylfhydrylowych stabilize the protein particles and ensuring the proper functioning of the tissue and its biological regeneration. MSM has anti-inflammatory activity (within the connective tissue, mucous membranes and digestive disorders). In the sports supplementation recommended for people with special physical activity and during convalescence after injuries. Also used in the prevention of treatment of diseases of old age. Available in multiple formulations, also containing chondroitin, hydrolyzed collagen, hyaluronic acid, extracts of vegetable dyes (turmeric), extracts of ginger root, ascorbic acid and minerals to support the functioning of the locomotor system. Dosage: 250-1000 mg daily (customarily taken in sports supplementation).